If you’ve been in the market to make your Pancake Day that little bit boujee’ier this year, then don’t worry – Marks and Spencer’s has got you more than covered. Rather than dousing your pancakes with just plain old lemon juice, why don’t you add a little bit of a boozy twist, as they’ve just brought out a Lemon, Gin and Tonic flavoured sauce and quite frankly it sounds bloody delicious. Pancake Day this year will officially land on 5th March, so you’ve still got a little while left to compile all of your ingredients before the rest of the nation dash to the shops, but hey – it’s always good to be a little bit prepared. It’s not just the gin element that holds the alcoholic punch, as the lemon curd actually contains the spirit as well as Indian tonic water. Don’t worry though, if you continue to put it on your pancakes before work in the coming weeks, it only ranges in at 0.5 per cent ABV, so there’ll be no hangovers coming your way anytime soon. Bad news though, as if you’re planning to bulk order online right now then they’re actually sold out, but you should be able to get your hands on a bottle of the lemon’y goodness if you take a walk on into one of their store Food Halls. After all, they’re only £2 a bottle. 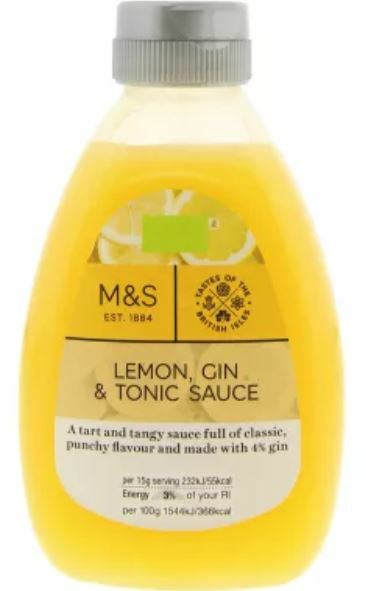 Failing that and you’re not quite a Gin person but you still want a bit of booze on your pancakes, then M&S is also selling a whiskey-infused honey. The Scottish Heather Honey with Single Malt Whiskey can easily be found in the food hall, however this new honey is slightly more expensive than the lemon and gin sauce, as it is £5 a bottle. But hey – can you really put a price on true happiness?